The Superb Lyrebird has had a long association with Springwood, a fact recognised by the artist Norman Lindsay in 1964 when he incorporated one into his design for a town crest. Over a hundred years earlier the French naturalist René Primevère Lesson, travelling across the Mountains in 1824, was fortunate to discover a ‘twitcher’ among the soldiers stationed at the military depot at Springwood who “had seen them very often, but always in the evening or the morning, and in the most secluded spots in the neighbourhood”. 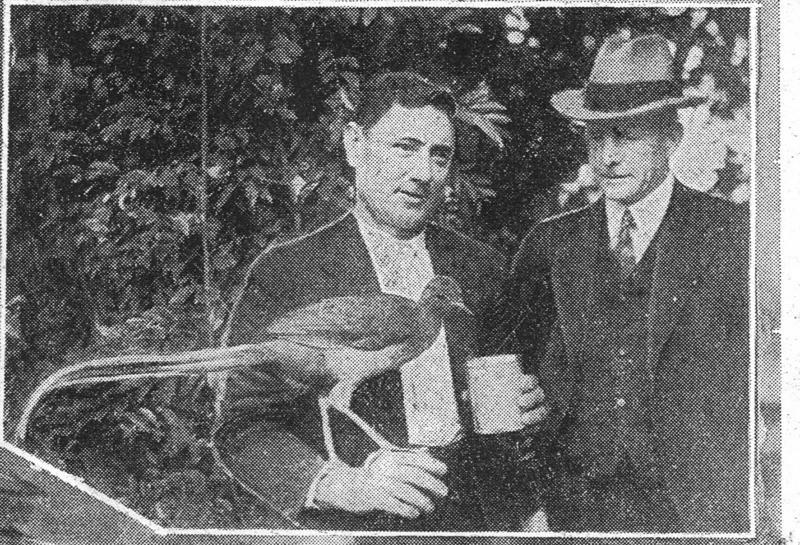 But perhaps the town’s most publicised association with lyrebirds occurred in the early 1930s when news spread that local bushman and naturalist Jack Coyle and his wife Ethel had successfully reared a pair of fledglings (Joe and Zoe) at their home in Raymond Road and were planning to breed from them. 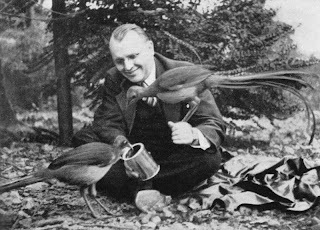 Though technically illegal, their project drew immense interest from ornithologists and naturalists (including Alec H. Chisholm) who descended on Springwood in numbers and, following a visit with the local member in June 1934, the NSW Chief Secretary gave the Government’s official sanction. The lyrebird, he said, was of “great scientific interest” and he wanted “to do all in his power to preserve [it] from destruction”. Joe and Zoe’s first attempt at producing offspring ended disappointingly when Zoe destroyed her egg after only twelve days. However, while several further attempts also failed, in 1936 she successfully incubated an egg for the full term. Lessons were learned from the earlier failures and every effort was made to give the birds the privacy they required and prevent predators from robbing the nest. The result was Pat, greeted by the Sydney Morning Herald with an article headed “Lyrebirds Start Hatching Family” and announcing the birth as “believed to be the first lyrebird ever to be incubated in captivity”. Among the many important visitors to make their way to Springwood in the coming months for an audience with the town’s lyrebird celebrities were the NSW Governor’s wife, Lady Edith Murray Anderson, and Mrs. Edith Stevens, the wife of Premier Bertram Stevens. They were both accompanied by their daughters and all were “greatly taken” with the birds, Lady Edith declaring Joe “the loveliest bird she had seen in this country”. Mr. and Mrs. Coyle became accomplished hosts, entertaining the dignitaries with anecdotes and stories and presenting them with special photographs, especially of baby Pat. Sadly, while Zoe, Joe and Pat brought Springwood into the popular and scientific limelight for a time, the story ends in tragedy. Pat was later killed in an accident, Joe died of stress in the aftermath of a bushfire and Zoe pined away within a few months of her mate of fifteen years. Fortunately Springwood retains a strong lyrebird presence and you are still likely to see and hear them in the gullies around the town, in their natural habitat.